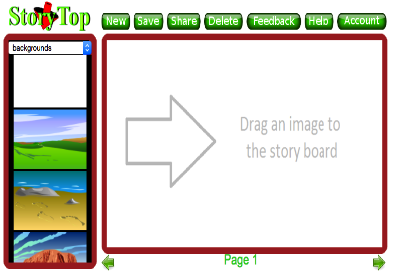 StoryTop is an excellent web tool students can use for digital storytelling projects. It is easy to use, free, does not require any software download, and login is not required in order to save or share stories. StoryTop provides a number of key elements for creating stories including: pre-made backgrounds, pictures of people and things, anime, text, speech bubbles and many more. With a simple drag and drop, students pick clip arts they want to use in their stories, type in their data and share their creations using a generated code.